There is no denying that the Porsche 911 is one of the most iconic sport cars of all time. It combines power, looks, and great chassis dynamics into one car. Being that the 911 is also aimed at the luxury car market, there is one big thing that many 911s are lacking, and that’s a good sounding exhaust. From the factory, the 997 Carrera S has a decent sound, but it’s hard to hear unless you are right next to it. 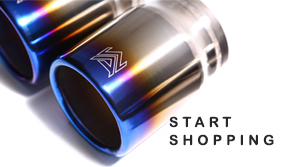 The problem with many aftermarket exhausts is they’re either too loud or too quiet. Once you install the exhaust, you can’t easily change the sound of it, unless you install a valved exhaust such as one of our Valvetronic systems. With a Valvetronic exhaust, you are not stuck with a super loud exhaust that will piss off your neighbors, and you’re not stuck with a quiet exhaust that no one can hear. When you need your exhaust to be quiet, you can close the valves, routing the exhaust gases through a muffler to reduce the noise. When you need your exhaust to be loud, you can open the valves and let your car sing! This is exactly what Armytrix USA employee, TJ, decided to do with his 997 Carrera S! Check it out below. Stay tuned for more photos and videos of this 997 Carrera S!